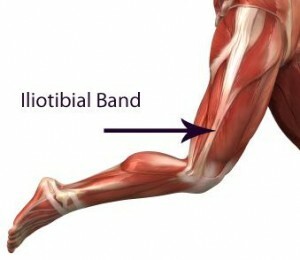 The Iliotibial band (ITB) is a fibrous band of tissue that runs down the side of your leg from pelvis to lateral knee. It is a stabiliser of the knee, helping knee ligaments to resist lateral (sideways out) movement. However, its main job is to resist lateral displacement of the hip. Many doctors diagnose this syndrome as an overuse injury that occurs when the ITB rubs on the lateral condyle (bone) of the knee, which the patient is often told, will be resolved by a small surgery to ‘release’ the ITB band. Actually the ITB injury is a more likely to be a secondary, compensatory injury. Why is the ITB under more tension, on one side than the other? The ITB is thick and tough, it was evolved when we were cavemen walking and running for miles. So what are we doing differently to our ancestors? Why would a ten K run bring on this very painful condition? Why is the traditional medical treatment rest, massage and stretching not relieving the problem? To consider the ITB syndrome we need to consider some major pelvic muscles in the ITB syndrome, called tensor fasciae latae (TFL), glut max and glut medius. TFL is a relatively small muscle that tensions the ITB when the knee is flexed. The ITB is made up of thick collagen fibres, which, flow from its insertion in TFL and glut max/medius down to the lateral bone of the knee and some fibres go into the tibial plateau (knee joint) and the kneecap. The band is thick and broad at the hip end and thins as it progresses down your leg, which shows that most of the work goes on at the top. How does ITB start? Unfortunately the TFL has a secondary job and that is acting as a synergist (helper) to glut medius. When a person is running or cycling the first muscle to contract is glut medius. This muscle stabilises the pelvis when the leg is off the floor, by contracting the glut medius the pelvis is squeezed together and this keeps the pelvis level. If we did not contract the muscle, every time our foot left the floor we would lurch to the side, as our hip would fall. The glut medius not only does this job it is also a postural muscle and any lower back problems force it to go into spasm to protect the stability of the spine. When it is in spasm, the synergists are recruited. TFL now does a job that it is not supposed to do and ultimately causes the continuous tension of ITB. This may go unnoticed for years but will give pain that “just starts” when we seem to be fit and healthy. If we have no problems with our lower back, TFL/ITB will be balanced because the nervous system is not stimulating the TFL muscles to protect the lower spine. Any threat to the balanced nervous system is registered in the brain and acted on immediately. Something as simple as having a tight lower back from driving too much or sitting in an office chair all day is registered by the nervous system responding to the potential threat.